The second edition (and perhaps the first?) 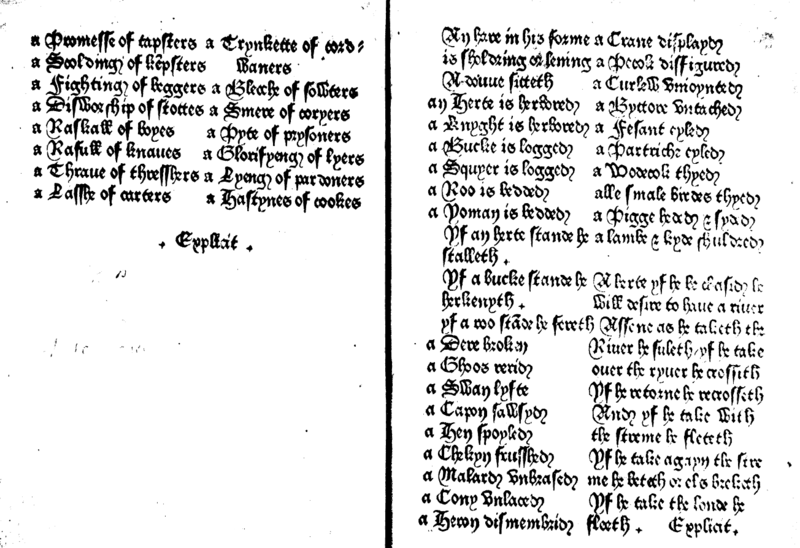 of Caxton’s 1477 printing of Lydgate’s “Horse Goose and Sheep” has a couple surprise endings: a list of collective nouns, followed by a list of hunting terms (which terms also fill out the last pages of Wynken de Worde’s two printings of the poem; some versions here). Such lists didn’t start with print culture, of course. Riches upon riches await you here if you click through to Thomas Wright’s A Volume of Vocabularies: illustrating the condition and manners of our forefathers, as well as the history of the forms of elementary education and of the languages spoken in this island from the tenth century to the fifteenth (and do let me know if you have a working link for Wright’s Second Volume of Vocabularies). For one manuscript version, see Laura Saetveit Miles’s very helpful blog post on Cambridge University Library MS Ll.1.18, ff. 44v-45r, a volume that’s full of hunting and cooking guidance. Miles in turn directed me to the enormously helpful Rachel Corner, “More Fifteenth-Century’Terms of Association’.” Review of English Studies (1962): 229-244, which, however, doesn’t consider the Lydgate “Horse, Goose, and Sheep” printings. A quick check shows that the Caxton and Wynken de Worde lists are similar to, but not identical, to the lists Corner provides. I haven’t examined manuscripts of the Lydgate, so I can’t tell you if these appear with hunting and cooking materials. If they did, or even if they didn’t, it’s clear that someone, somewhere, decided that Lydgate’s animals poem could travel well with other animal poems. And though “Horse, Goose, and Sheep” isn’t much concerned with hunting (otherwise we’d have dogs and hawks in it too), animals were animals, at least to some fifteenth-century reader. That’s obviously a point that needs more unpacking. 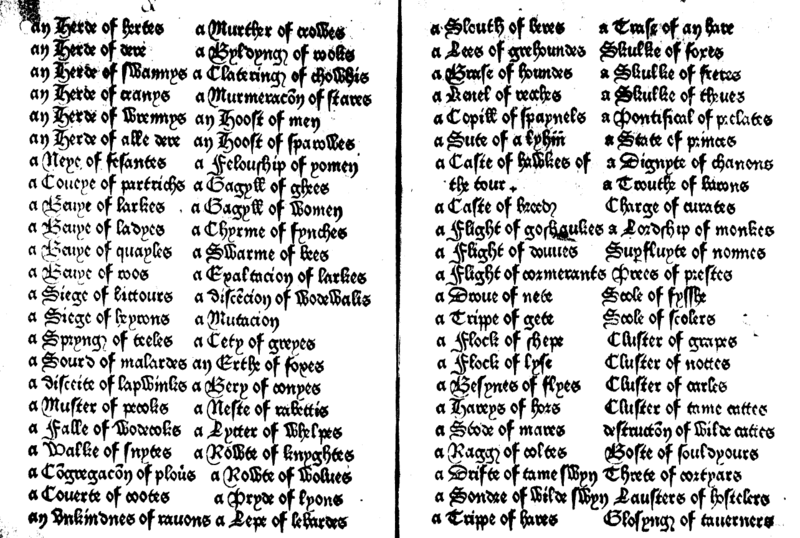 Second, though: a post that produces a modern edition of medieval collective nouns like this, which organizes the nouns neatly into groups of beasts, birds, dressing of game, objects, and humans, misses the point. It misses both the inhuman charge of alphabetization as well as the associational logic less concerned with human and other difference than with similarities of mass, motion, and needs. It’s not that the human disappears in these alphabetical lists, but rather that the logic of the alphabet prevails, if we want to get linguistic (though edit of course the list isn’t really alphabetized! ); or, if we want to get materialist, it’s that the logic of recognizing a group differs wildly from that which tries to carve out a recognizable individual, whether human, nun, or otherwise, from the heterogeneous field of stuff. More could be said, of course: there’s probably a conference paper lurking in this post somewhere. This entry was posted in MedievalBlog and tagged animals, lydgate by medievalkarl. Bookmark the permalink.